Video games are played at the arcade, at home on a television or personal computer, and as a handheld portable game. They are packaged in large consoles, game paks that can only be played on the same manufacturer's hardware (i.e. Nintendo, Sega Genesis, and Sony Playstation), and as CD-ROMs. Made up of a program that instructs the computer to display specific visual and audio effects, video games utilize cutting-edge technology in order to provide fast paced entertainment. Recent statistics show that 70% of all children in the United States have home video game systems. Over four billion dollars is spent on arcade video games annually. A precursor to the video game, pinball machines were introduced during the 1930s and remained popular through the 1970s. In 1971, a video arcade game was produced called Computer Space. Invented by Nolan Bushnell and Ted Dabney, Computer Space was the first real coin-operated video game, but for various reasons, it never became popular. It did however, lay the groundwork for the next video game that Bushnell and Dabney introduced: the phenomenally successful arcade game Pong. Modeled after the game of ping pong, it was an electronic game in which players tried to hit a flashing dot passed their opponent's video paddle. With the success of Pong, Bushnell and Dabney started the Atari Company, and in 1975, they introduced a home version of Pong. In 1976, Warner Communication purchased Atari for $28 million and expanded its home line of video game cartridges. At the same time Bushnell and Dabney were developing Pong, Ralph Baer, who was working for Sanders Associates, was designing a home video game system called The Odyssey. Developed in 1969, Baer's system was finally manufactured and distributed by Magnavox in 1972. The Odyssey was a package of 12 different plug-in games that were housed on circuit cards. Each game came with plastic overlays that, when placed over the television screen, simulated the appropriate background. For example, a plastic overlay of a hockey rink was included with the hockey game. The Odyssey also offered an electronic shooting gallery with four additional games and an electronic rifle. Eighty-five thousand systems were sold. Rapid advances in electronics technology during the 1970s led to the development of more complicated games, such as Space Invaders and Pac-Man. Introduced in 1983 as a joint venture between the Namco Company of Japan and Midway of the United States, Pac-Man has sold hundreds of thousands of games and remains one of the most popular video games. When personal computers became available, computer games were created. Many of these games were adaptations of arcade or home video game systems, however unique games were also developed. The computer game industry grew swiftly during the 1980s powered by various companies, especially the Nintendo Corporation. In the late 1980s, the CD-ROM was introduced. These disks could hold more information on them, and allowed the development of more sophisticated, interactive games. In 1995, digital video disks (DVDs) were first produced for home computers. Since they have a storage capacity over twenty times greater than CD-ROMs, they promise to revolutionize computer games. Design is the key aspect of making all video games. It is typically done by a team of skilled computer programmers, writers, artists, and other game designers. During this phase of development, they generate the game's specifications, which includes game type, objective, and graphics. While creating a video game is rarely a step by step process, there are a variety of tasks that must be accomplished during the development phase. In the beginning, the type and objective of the game is determined. In general, games fall within six categories, or genres, including fighting, shooting, strategy, simulations, adventure, and run, jump and avoid (RJA). Fighting games require the players to battle with each other or the computer. Presently, they are the most popular and encompass such titles as Mortal Kombat and Street Fighter. Shooting games involve battles in which the player tries to destroy enemy tanks, ships, or planes. Strategy games include such classics as chess, bridge or checkers. Simulations are games, which reproduce real life situations such as flying or driving. Adventure games are computerized versions of role-playing fantasy games. The RJA games are those like the Super Mario games in which a character tries to reach a goal while being impeded by various obstacles. The action of the game is dependent upon its intended venue. An arcade game must have immediate action. A home version usually includes various skill levels in order to keep the player interested over a longer period of time. A handheld version of a video game is simplified to be played in miniature. Although the most important raw material in creating a video game is imagination, a number of supplies are necessary to bring that imagination to life. Once the story has been created, characters and background are drawn on storyboards, then transferred to electronic format directly by an artist or via digitization. Lifelike action is captured on film and sound is recorded on digital audio tape (DAT). Once design is complete, a variety of raw materials are used to produce video games. This includes the materials that go into making the storage medium, the accessories, and the packaging. The most common storage mediums are floppy disks and CDs. These are made with hard plastics such as polycarbonates. CDs have a thin layer of aluminum or silver coating. Additionally, they are coated with a protective, clear acrylic coating. Floppy disks are made with a thin plastic that is coated with a magnetic material. Plastics are also used to make the accessory pieces that some computer games require. In each of the plastics used, a variety of fillers and colorants are incorporated to modify its characteristics. Typically, computer games are packaged in highly decorated cardboard boxes. Creating a video game is a long, multifaceted process that can take up to one year to complete one game. 1 Typically, writers are responsible for creating a game's story complete with a setting, characters, and plot. This gives the game a purpose and makes it more enjoyable for the player. It also provides an objective for the player and a guideline for the rules of the game. This information is then used to create the game's manual. Often, the inspiration for a story is derived from popular movies or books. The story is transferred to storyboards, where preliminary drawings are also added. Storyboards are a series of one-panel sketches pinned to a board. Each sketch is accompanied by story dialogue and/or character description. Creating a video game is a long, multifaceted process. A team of designers, artists, and programmers work together to create the final product. After the type of game and story are outlined, the game's format can be determined. The format refers to what the player sees when playing the game and a game may utilize one or more of these formats. The artist adds drawings to storyboards, including character descriptions and arrows showing how the characters will move. 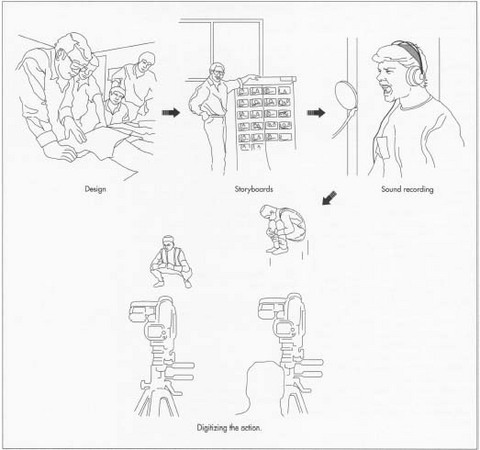 Sound and life-like action is recorded. and text. Platform games are those that feature a side view of the player's character. Top-down games give a bird's eye view of the player's character. They are often used for war games. The isometric format is a top-down game, which uses perspective tricks to give the illusion of 3D. True 3D games are just now becoming a reality with the introduction of CDs and DVDs. These represent the future of computer game formats. Text game formats have limited graphics and are only used for interactive fiction. In general, all games may use one or more of these formats. 2 The artist adds drawings to storyboards, including character descriptions and arrows showing how the characters will move. After the programmer has written the program for the game and the recorded sound and action has been digitized, the game code is transferred to a master compact disk. This disk will be used to mass produce thousands of copies. The disk is put into a laser-cutting machine. While the disk is spun, the binary code from the computer game's program sends a signal to the laser. The laser will then cut pits in the photo resistive coating corresponding to the program. The disk is then chemically etched and given a metal coating. frame that will be used to create an action. Typically, six to 10 frames are used to show a character running/walking one step. Four to five frames are needed to illustrate a punch or a kick. The background is also created by the artist using both converted and digitized images. Though seemingly cohesive to the viewer, the background is really a collage of many different images. 4 Dialogue and sound effects are recorded in a sound studio using various audio techniques. Once recorded on digital audio tape (DAT), the sounds are computerized by a synthesizer—a computer that specifically alters and translates sound into data. 5 When all of the preliminary design elements are determined, programming, or coding, can begin. The first step in this process is drawing a flowchart, which shows the logical progression of the computer program. A variety of programming languages are used such as C++, Java, or visual BASIC. The code is typically produced by a team of programmers, each working on a different phase of the game, and can take up to seven months to produce. To speed the coding process, previously developed algorithms are often modified and adapted to the new game. This is more efficient because it eliminates the need to continually rewrite similar programs and reduces the chances of serious errors. Each action can require many individual instructions written by the programmer, and roughly 250,000 individual commands are written to create a video game program. Sound and graphics must also be programmed separately. 6 The testing phase of game development helps reveal fundamental design and programming problems. Testing can be completed in a number of ways. The programmers can run the game and try to discover gross problems themselves. Additionally, professional playtesters are used. These are people who are specifically trained to play the games and look for subtle errors. They are typically game designers themselves, and have experience with many types of games. Beyond finding errors, playtesters also give criticisms and suggestions to make the game better. In some cases, computer game developers use people from the general population to test games. This gives them information about consumer acceptance. The information obtained from the testing phase is reviewed. Reprogramming is then done until the game is appropriately tweeked. 7 When the programming is completed, the game code is transferred to a master compact disk. This disk will be used to mass produce the thousands of copies needed. The master disk is composed of a smoothly polished glass coated with an adhesive and a photo resistive material. This disk is put into a laser-cutting machine. While the disk is spun, the binary code from the computer game's program sends a signal to the laser. The laser will then cut pits in the photo resistive coating corresponding to the program. The disk is then chemically etched and given a metal coating. At this point, it is an exact replica of a finished disk. 8 A metal inverse copy of the master disk is then made through a process known as electroforming. Using an electrical current, metal is deposited on the master disk surface. This inverse copy is then used to make multiple metal masters through a similar process. These metal masters are used to make multiple inverse stamping copies. 9 To mass produce plastic compact disks, the stamping copies are put into a die in an injection molding machine. In this machine, polycarbonate pellets are placed in a hopper and drawn through a long screw device. While it is drawn, the plastic becomes molten. It is then injected into the die with the stamping copy. It is held under pressure for a few moments and then allowed to cool. As it cools, it hardens giving it exactly the same pattern of pits as the master copy. It is then released from the die and inspected for flaws. If any flaws are found, the disk is rejected. 10 The disk is then transferred to a machine, which punches a hole in its center. It is then coated with a thin film of either aluminum or silver using a vacuum deposition technique. Next, a clear acrylic plastic is applied. Finally, the disk is transported to a silk screen assembly and a label is printed on it. 11 All the components of the game are transported to the packaging line. Here, each part of the game is placed in a preprinted, cardboard box. This process may either be done by hand or by automated machinery. The game boxes are then conveyored to a shrink-wrap machine that seals them in plastic. They are cased and ready for shipment. The process of transferring the computer game program to a compact disk, or DVD, must be done in a clean, dust-free environment. This is because dust particles are much larger than the pits carved in a disk, and a single particle can ruin a disk. Therefore, strict quality control measures are taken to control the environment around the disk-making process. Other visual inspections are done at various points during the disk manufacture. Random samples of finished disks are also tested to make sure the program is working properly. 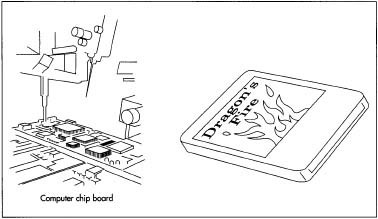 Beyond the checks involved in disk manufacture, the other components of the game are also checked to ensure they meet the required specifications. At the end of the manufacturing process, random samples of the finished product are checked to make sure it includes all of the necessary components. Computer game programming continues to become more sophisticated as the available hardware improves. The most important recent advancement that promises to revolutionize gaming is the development of DVD technology. This will allow a much greater amount of information to be included in the game's program. This should improve many aspects of the game such as the artificial intelligence routines, the graphics, and the special effects. Things such as video clips will be included to make the games more interactive. Gruber, Diana. Action Arcade Adventure Set. Coriolis Group, 1994. Katz, Arnie and Laurie Yates. Inside Electronic Game Design. Prima Publications, 1997. Sawyer, Ben. The Ultimate Game Developers Sourcebook. Coriolis Group, 1997. Bunn, Austin. "Joystick City." The Village Voice (December 30, 1997). Wright, Maury. "DVD: Breathtaking Sight and Sound, Significant Challenges." EDN (August 15, 1997). This is an amazing article that helped me ,but you should include the extremely vast amount of diverse fields of information needed to create a great amount of the most successful games of all time. I predict that in the near future creating a simple game will no longer be simple (by the current standards) because by that time it will stretch to every field of knowledge known to man.